As preventative: 1/4 lb. per 1,000 gallons of water. Kills algae on contact — visible results within minutes! 2 lb. container will treat an 800 gallon pond for four to five months! 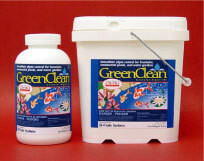 EPA registered product provides extremely fast results in treating both green water and string algae.